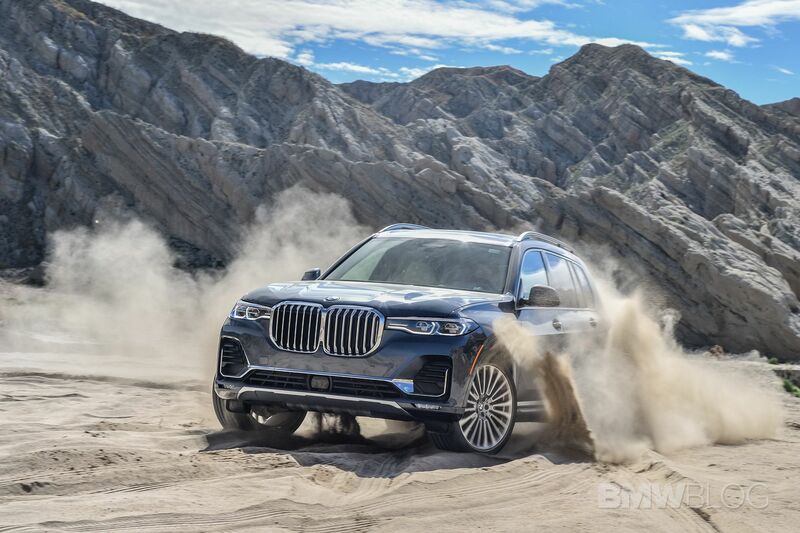 My first experience with the BMW X7 dates as far back as May 2018 when BMW has invited me to test a prototype version of the upcoming 7-seater luxury SUV and to provide some feedback before the final car goes into production. Nearly 10 months later and I am back in what will be the X7 that customers will buy at their local dealerships. To sample two variants of the luxurious and large X7, BMW gave me a few options, all in the form of a road trip. 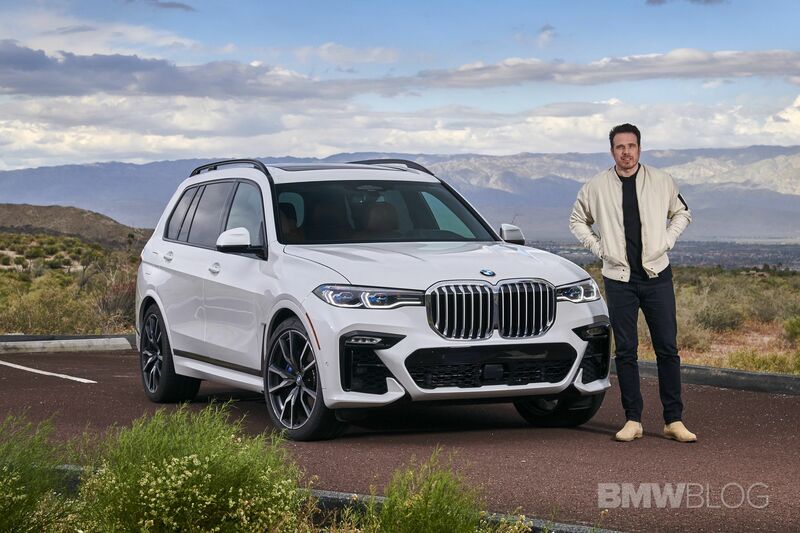 The BMW X7 media program kicked off five weeks ago in the home of BMW USA – Spartanburg – before heading down to Florida and across the country to Los Angeles. 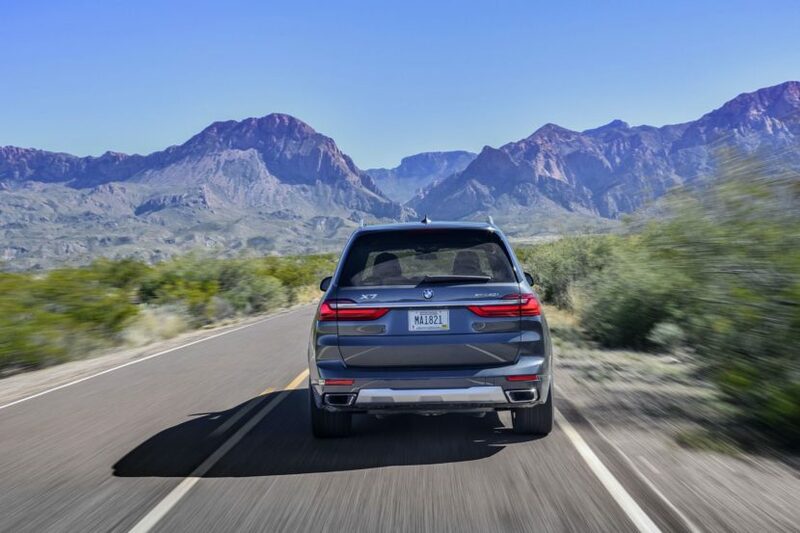 All trips had some appeal built into them – from Baton Rouge to the Big Bend, or from Death Valley to Palm Springs – there was a little bit of America to be experienced behind the wheel of the X7. It’s also one of the most daring BMW driving programs I’ve been a part of, with lots of moving parts and logistics to handle. So my choice this time around was to pick the Los Angeles to Palm Springs leg which was instantly appealing due to a light off-road course that will end the trip. With the SUV market growing faster than ever – and especially the high-end of it – BMW was looking to capitalize on the demand and therefore created not only their largest SUV ever, but also a flagship model, similar to what the 7 Series is to the sedan lineup. The X7 stretches 203.3 inches from bumper to bumper, it has a width of 78.7 inches and stands 71.7 inches tall. Furthermore, the wheelbase is 122.2 inches which is about 10 inches longer than the 7 Series Sedan and 5 inches longer than the X5. Overall, the X7 is 9 inches and something longer than X5. So yes, the X7 is a big car, just as you’ve imagined. During my trip, I came across a few Range Rovers at the stop light and it was immediately obvious who the “Big Boy” was. 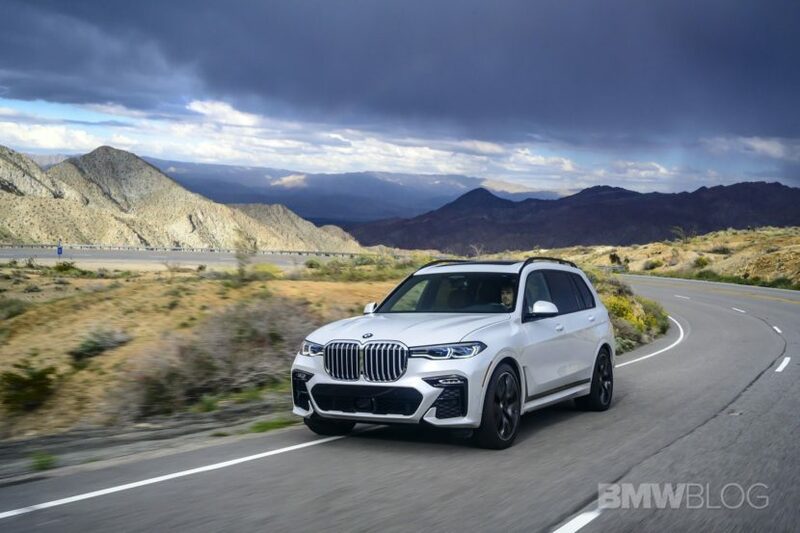 For those of you wondering about any similarities with the Rolls-Royce Cullinan, BMW has an answer for you – very few similarities, in fact, the engineers say less than 1 percent of the parts are shared with the ultra-luxurious Rolls. If there is one car that the X7 will compete neck-to-neck, then it has to be the GLS from Mercedes-Benz, a nearly identical model in size. Those of you that might care about the weight of the X7 – not sure why anyone would – here is the figure – somewhere over 5,300 lbs, based on the model and configuration. Heavy? Yes! Unexpected? Not at all, considering how big recent BMWs have become. Two models were available to sample – the 4.4 liter V8 X7 xDrive50i and the 3.0 liter inline-six X7 xDrive40i. Both of those models are available to American customers, but the Europeans will have to do without the V8 power. 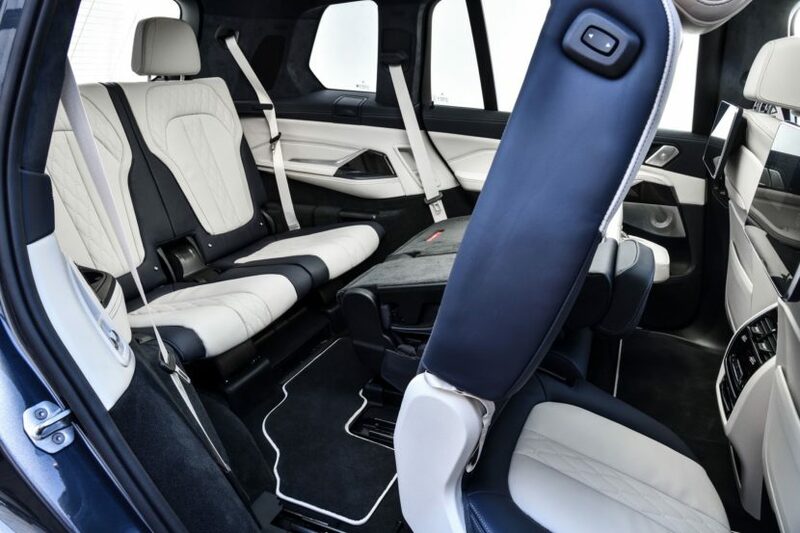 To make things even more interesting, the BMW folks have added six and seven seats configuration X7s, but all, of course, have a third row. The six-seater differentiates itself with two, beautifully crafted captain’s chairs that offer significant space in the second row. 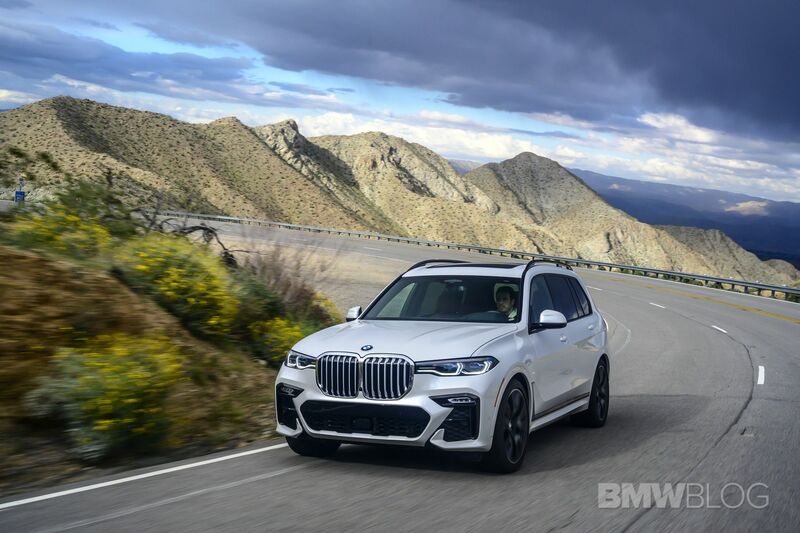 It’s fair to say that BMW has been and still is an engineering driven company, so lots of the topics with the X7 folks revolved around driving dynamics and how the BMW DNA had to be part of the X7. While I applaud that effort, in my opinion, the X7’s selling point won’t be the driving dynamics, but rather the luxury, tech, comfort and space offered by the large SUV. 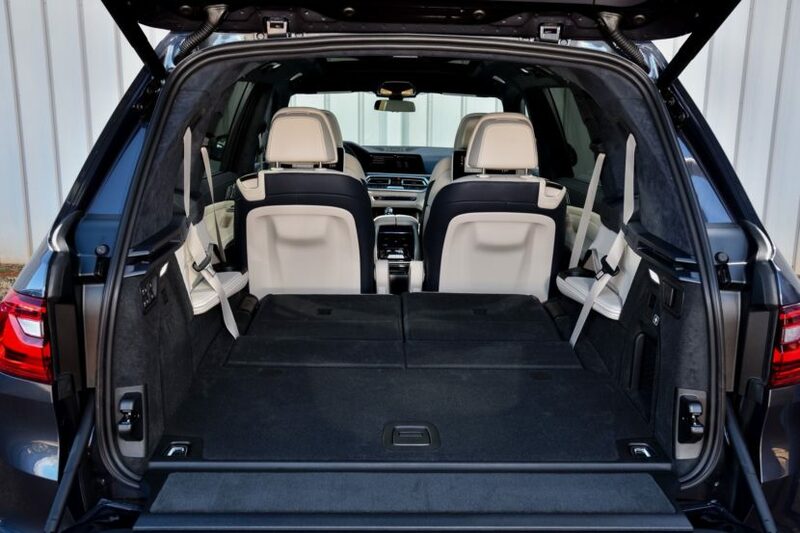 The BMW X7 features the latest and greatest in BMW tech, yet very similar to what the new X5 offers. 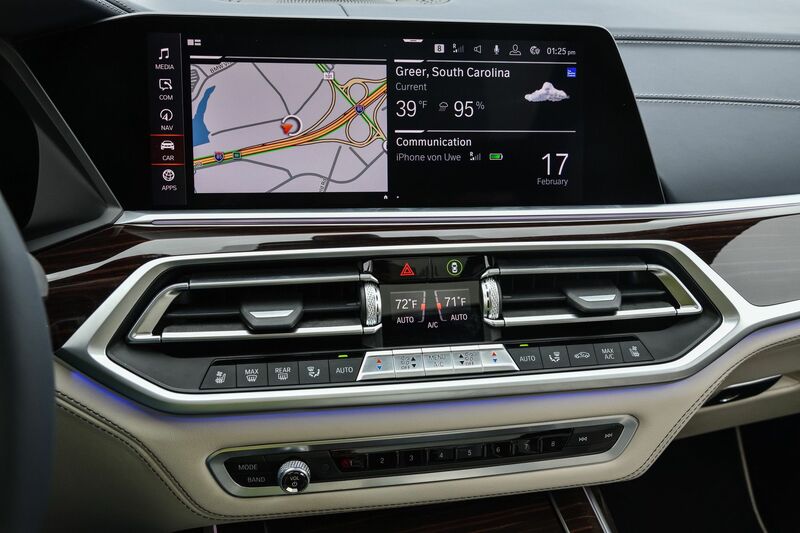 The center console is all about the large 12.3 inch infotainment system with the latest iDrive 7 or Operating System 7.0, as they call it elsewhere. Another 12.3 inch lies behind the steering wheel which is highly configurable with lots of data points available to the driver. 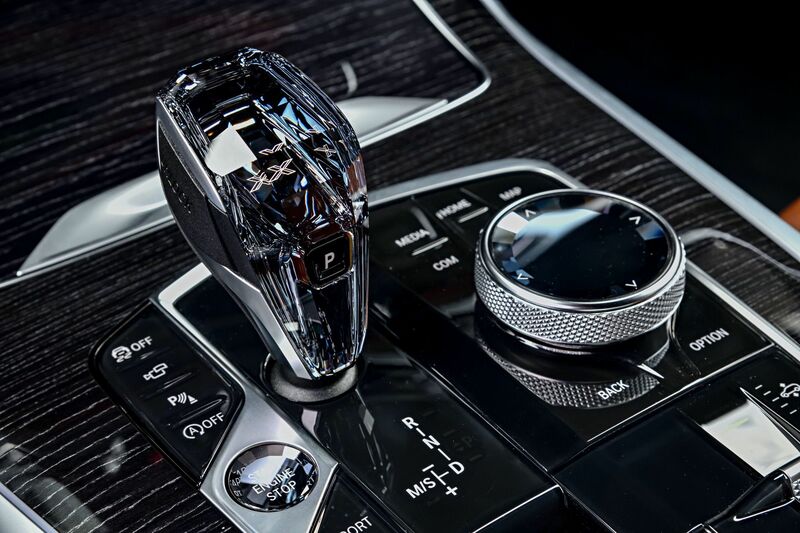 The center screen can be operated via touch, gestures or the old school, yet still every effective, iDrive knob. While I love the iPad-like screens, I still find the knob turns and pushes to be more effective and less distractive. Again, you can customize lots of info on the large screen and it’s intuitive and user friendly. If you move down on the console, you will find a pair of switches and knobs that operated various functions of the car, from the HVAC to radio volume and a list of features too long to list here. Further down, you’re getting the “Holy Grail of tech” in a luxury SUV – front cupholders which can be heated and cooled. A gimmick? Not at all, that’s exactly the details that high-end customers look for in their Sport Utility Vehicles. For the geeks, BMW has included an inductive phone-charging system which worked perfectly with my iPhone X, and of course, the Apple CarPlay, which can mirror your phone. and basically your digital life. What else is useful in a family vehicle? Yes, you got it! USB ports and thankfully, the X7 has plenty of those. 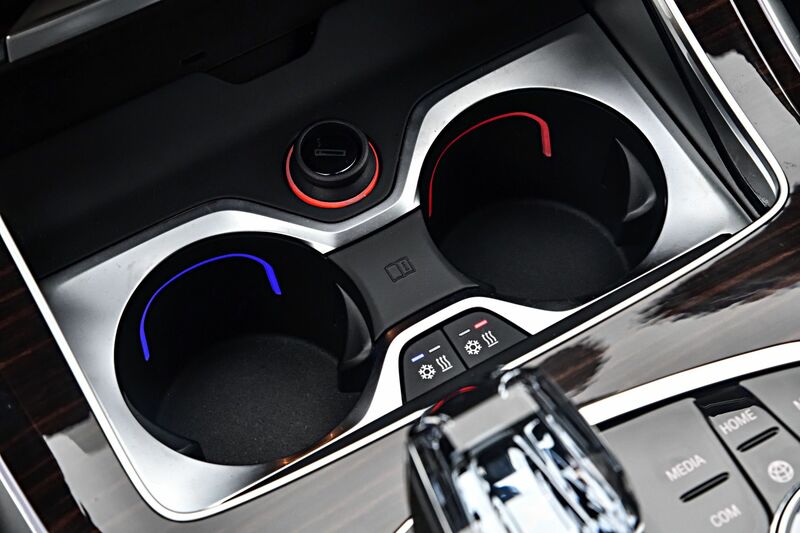 The center console features one USB-A port (the one that has been around forever), one USB-C in the center storage space, while the second and third rows get a total of four USB-C ports split evenly. So if you travel full house and with lots of kids, BMW has got your charging needs covered. Our X7 testers were also equipped with Wi-Fi Hotspots, to the happiness of my European colleague who was on a Data Roaming plan. If you wanna show off, then the BMW Intelligent Personal Assistant can be activated, in standard form, by the “Hey, BMW” voice command. Just like the system we tried in the new G20 3 Series, the Siri-like system can take a wide range of commands, from directions to locations finding, to temperature changes inside the car or changing the mood setting. Bored yet of all the tech? Too bad, cause there is more. But will keep the fine details out. 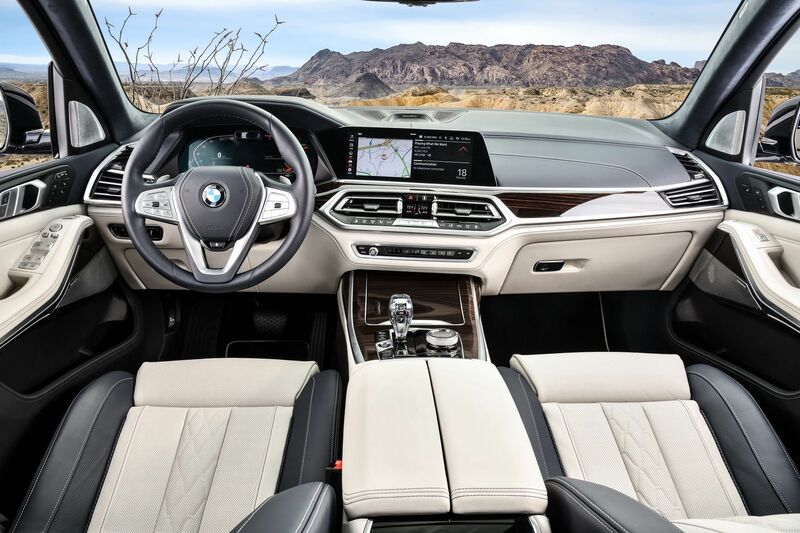 The X7 also gets ambient lighting, 3D speakers, a whole host of safety systems – active lane-keep assist, automatic lane change assist and adaptive cruise control with stop-and-go functionality, Panoramic Sky Lounge LED moonroof – kinda cool actually – comfort access with soft-close doors, rear entertainment and some other things that your BMW salesperson can walk you thorough. 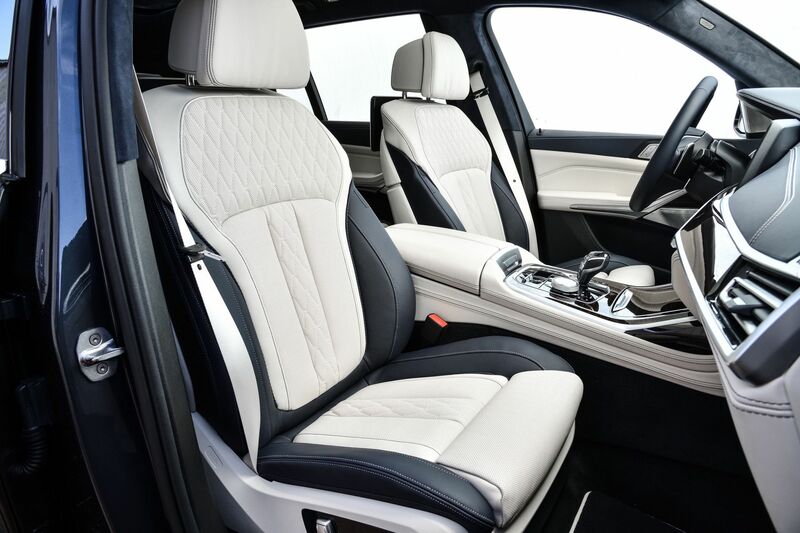 Just like with the new X5, and with some other new BMWs, BMW has finally stepped up their interior design game. 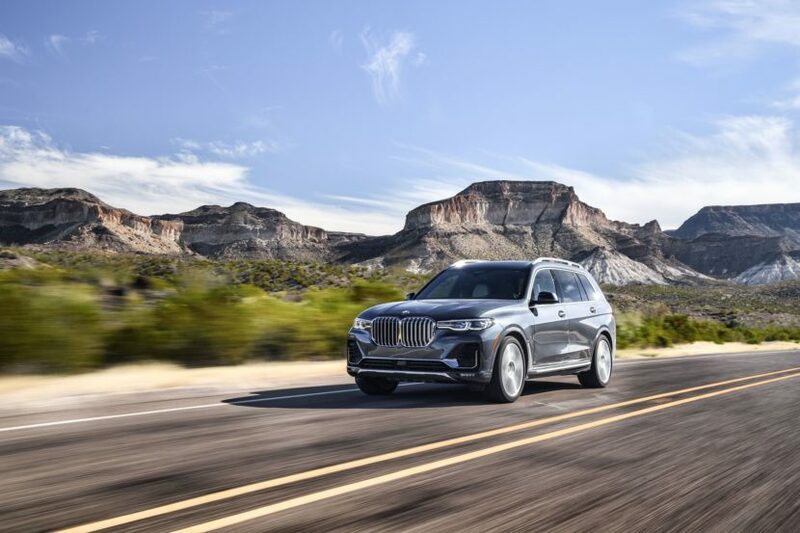 There is general consensus that the design and quality of recent BMW models is significantly better than before, and the new X7 demonstrates that with a cohesive design inside the car that equally caters to the driver and passengers. You’re getting the same stretched out dashboard that’s designed like a cocoon around you, yet it feels roomy. The leather quality is the finest you can get in a BMW, the trim options are quite extensive and of high-quality; there are Alcantara roof linings, optional pillows for second-row headrests, massaging chairs, contrast-stitched seats with panels of perforated and quilted leather, and again, much more than I can list here today. I also recommend the glass applications made of Swarovski crystal which give you a new gear shifter and iDrive knob, for that extra pop. 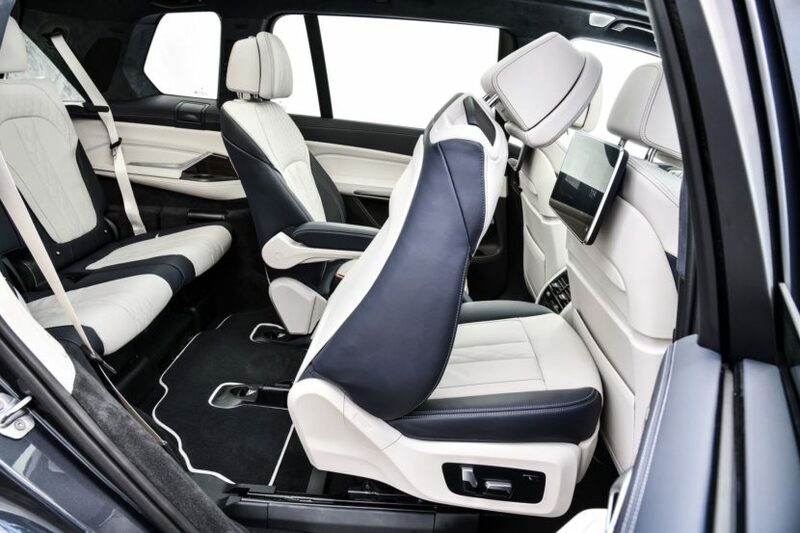 If you’re not happy with the “standard” things, BMW has you covered with a BMW Individual Program that, for the right amount of money, will make sure you feel quite special in your X7. It’s tough to argue that space is not at the top of the list of most buyers of large SUVs, in the end, this is why us, the Americans, love the likes of Cadillac Escalade or Lincoln Navigator, so while the X7 is smaller than these two, it’s certainly large enough for most buyers. Before I jump into some more numbers and stats, let me bring up again my height and weight – 6″3 and around 210 lbs of pure muscle (on a good day). 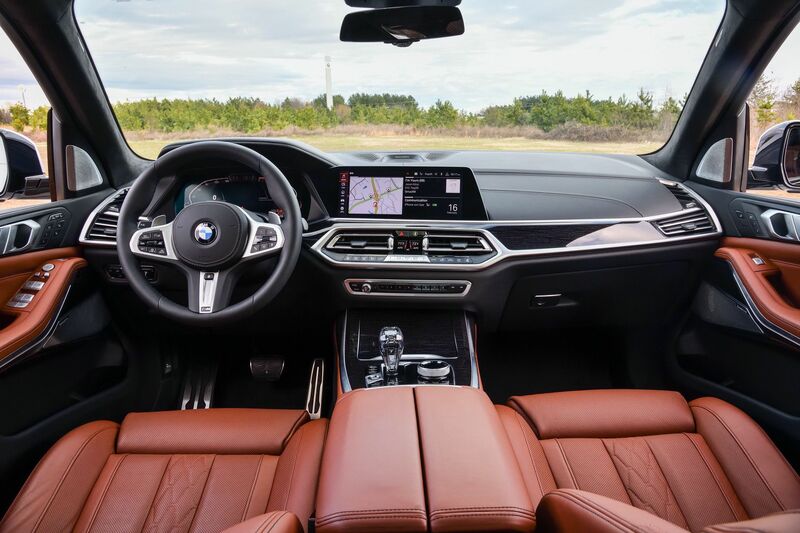 During my drive with the X7, both the six and seven seater, I had the opportunity to drive the car – obviously – but also spend some time in the second row, and some limited amount of time in the third. Upfront, I had no issues with forward and lateral space, even without having the seat pushed all the way back. The ride was quite comfortable, the seats’ bolster functions were great and my back was quite happy after the couple hundred miles trip. 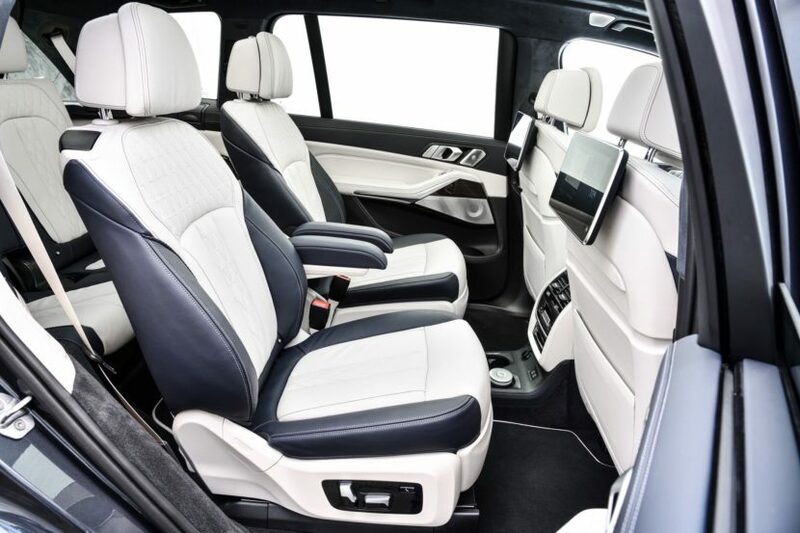 In the second row, I have to say that I favor the captain’s chairs, mostly because I love my personal space – childhood issues – and because I found them to be perfect for a luxury SUV. These chairs also get integrated armrests and cushions, while the space between them can be used to slide into the third row. Nonetheless, if you want to get the best bang for your buck, then I recommend the bench with an additional seat, since it still offers great comfort and legroom. Even with the driver’s seat set back, I was able to easily slide into the second row with space to spare for my knees. The seats in the second row can also be tilted forward fully which helps to easily get in and out of the third row. 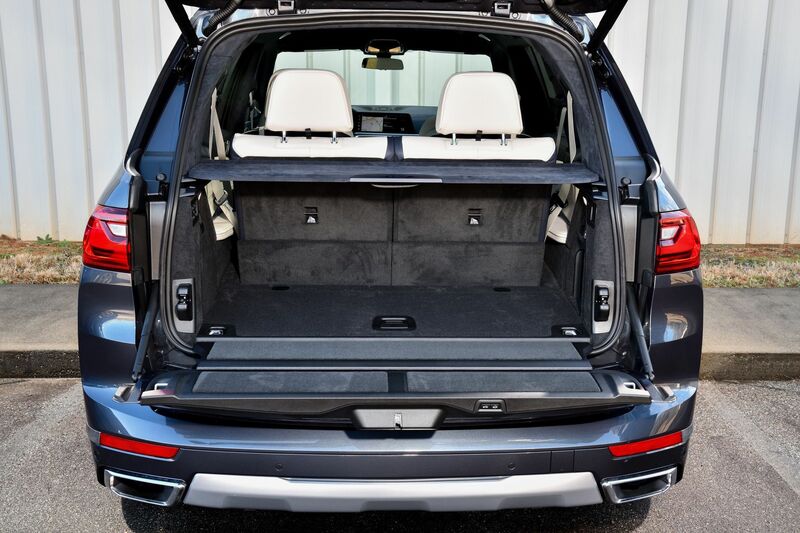 The rear doors are larger than the front ones which is another helper for easy access to the last row. 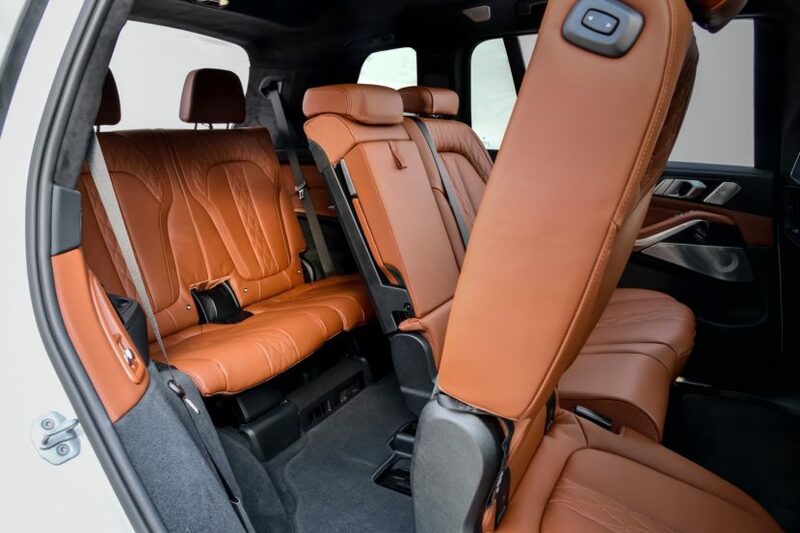 With a single push of a switch on one of the second row seats, they start to move forward and up, the front seats also move forward and space for the third row opens up even more. I find myself now in the third row and not surprisingly, having decent space. The knees are slightly bent, but not touching the second row. There is plenty of headroom and lateral space is also sufficient. The feeling of roominess is also aided by the individual moonroof in the back which allows more light in. It also feels like your own little lounge back there since you can adjust the climate zone and seats’ heating, while the ambient lighting accents can be adjusted to your mood. It also includes the highly coveted cupholders, of course. The seats movement can also be controlled by the drive with a switch on the door. 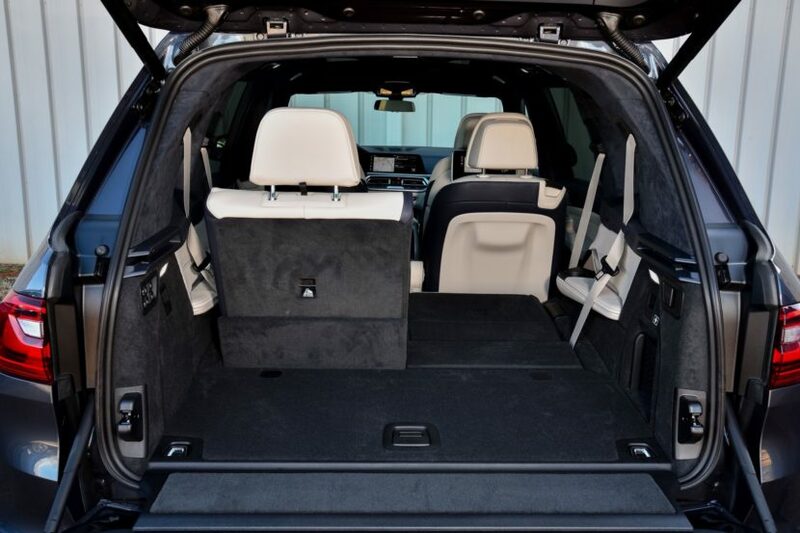 When all seats are in use, the X7 offers 48.6 cubic feet of cargo capacity, and 90.4 cubic feet when the seats in the second and third rows are folded down. In comparison, the Mercedes-Benz GLS has 49.4 cubic feet (third row down) and 93.8 cubic feet (second and third rows down). As far as cargo space, with all seven passengers onboard, I was able to fit one airline-approved roller-bag and a small briefcase by its side. First X7 I sampled was the 4.4 liter V8 50i with 456 horses and 479 lb-ft. It’s same powerplant that has been used in previous “BMW 50i models” with a smooth power delivery and enough torque at low rpms to catapult the heavy X7. The ZF eight-speed automatic transmission is also familiar from other models, with quick shifting that fits the character of the X7. According to BMW, it can blast from 0 to 60 mph in 5.4 seconds, while the xDrive40i does 6.1 seconds. Both models were fitted with 22-inch wheels and run-flat performance tires, so naturally the ride would be slightly harsher and noisier than the standard 20-inch wheels with all-seasons. Speaking of noise, this X7 also had the standard acoustic glass windshield and the optional double-pane acoustic side windows which work beautifully to isolate you from the outside noise. The X7 xDrive50i was also equipped with the optional M Sport and Dynamic Handling Packages which beef up the steering and suspension, lowers the ride height by 0.8 inches and provide additional agility on the road. The M Sport Pack also comes with a throatier exhaust. 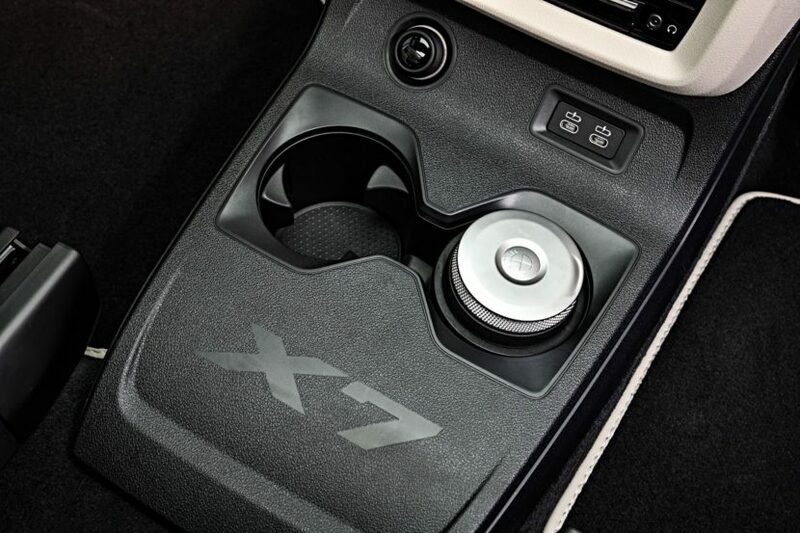 One interesting change in the four drive modes of the X7 is the larger differentiation between them. While most new BMWs are built with a small gap between Comfort and Sport, in the X7, the differences are bigger. 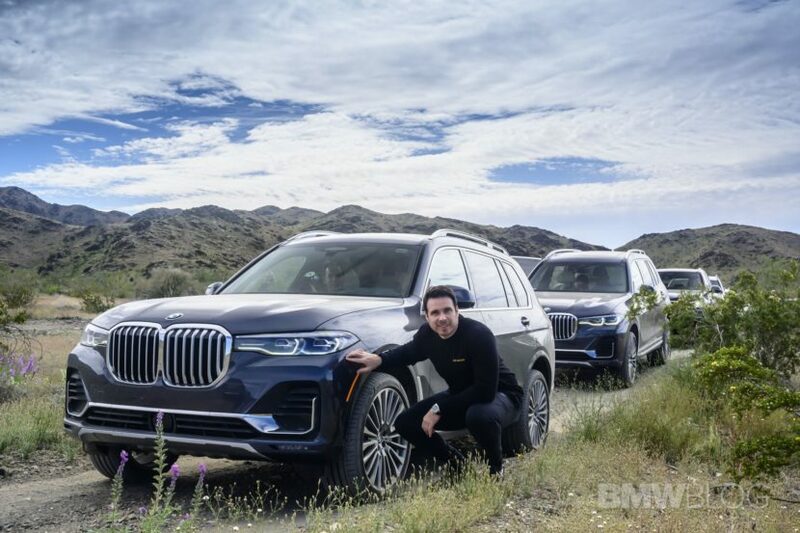 Dr. Daniel Nowicki, Project Manager Driving Dynamics BMW X7, says that research conducted by BMW showed that customers often stick to one mode since they find them so close in specs, but with the X7, the idea was to make Comfort even more different than Sport. The M Sport package also adds the M Sport differential which mitigates understeer and helps the driver navigate easier through tight corners. In my experience with the car, it certainly helped with the heavy X7 when sprinting through the mountains surrounding Palm Springs. Standard on all X7 models is the two-axle air suspension with its air supply being controlled individually for each wheel, enabling it to balance out an uneven load. The ride height is adjustable based on the driving mode and speed, and has a range up to 3.1 inches (80 millimeters). Since comfort is the name of the game, BMW has included, again standard, the Dynamic Damper Control. Anti-roll bars can also be added to the package, along with the Integral Active Steering. Customers can also option an Off-Road package that allows for a rear-lock differential, while the steering configuration can be optioned as well – electronic steering system standard and active rear steering system for an extra cost. The Integral Active Steering, using a variable steering ratio with passively steered rear wheels, delivers improved stability and comfort. The system steers the rear wheels in the opposite direction as the front wheels, at certain speeds, significantly reducing the turning circle and making for easier maneuvering during tight situations. Motion sickness reduction is also one of the benefits this system. The steering inputs are a bit slow, 2.8 turns lock-to-lock, yet that’s quite typical in the segment. On the highway, the X7 is planted on the road, with a confident stance aided by the high driving position as well. The Sport mode is clearly the more fun one, especially since you’re getting a bit more driving dynamics into the X7’s chassis. But for the first time, in a while, I actually rode mostly in Comfort and enjoyed the serene drive. I’ve also particularly liked the silence in the cabin (you can leave home your noise-cancelling headphones), which allowed for easier conversations, but at the cost of going over the speed limit, if you don’t pay attention. 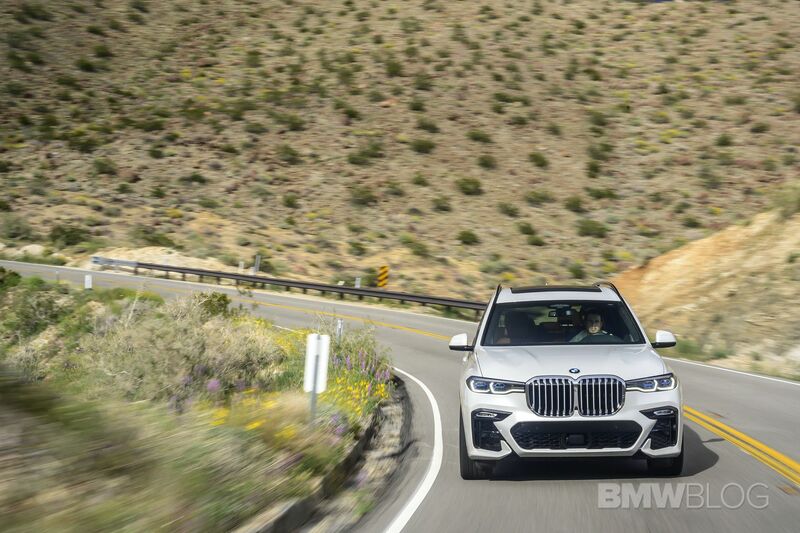 Compared to other new BMWs, the X7 doesn’t have any fake sound pumped into the cabin, which is likely what customers of luxury SUVs prefer anyway. From the outside, the V8 sounds pretty great! The jury is still out on whether US customers will prefer the V8 over the six-cylinder, but nonetheless, I had to sample the 3 liter as well. 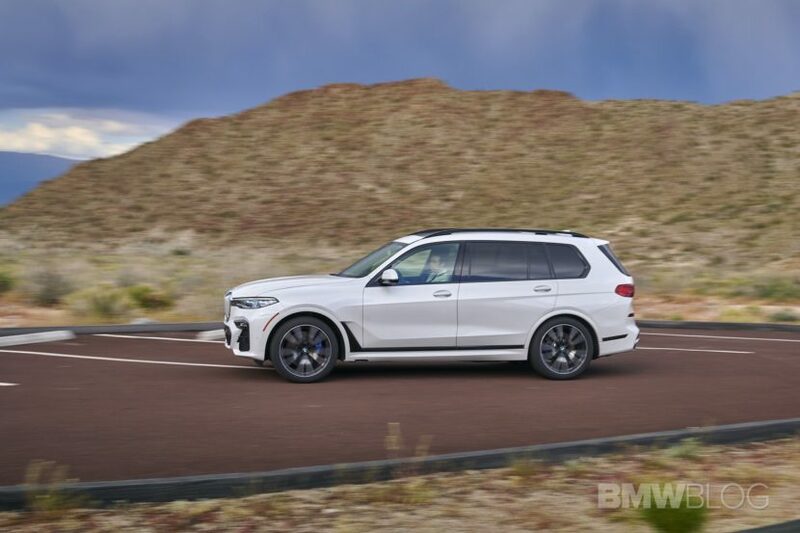 The BMW X7 xDrive40i uses the new B58 inline-six engine delivering 335 horsepower and 330 pound-feet of torque, which will get you from zero to 60 mph in 5.8 seconds, according to BMW. My first impression was that the power output is borderline with what’s acceptable in a car of this size, since the 5,000 lbs heft can be felt more than in the 50i model. The X7 40i takes a bit longer to launch, but as soon as higher torque (max torque from 1500rpm) kicks in, the drive becomes more spirited. It’s essentially the same B58 engine characteristics from other models, so it has a great sound, lineal power delivery across the band and pulls hard when you floor it at higher speeds. The shifting is just as smooth with the ZF eight-speed. Again, no surprises here. Both models use an updated xDrive system with the torque being split based on the driving conditions, speed and mode selected. If you’re into hauling a small boat with you, then you can take advantage of the X7’s towing capacity of 7,500 pounds. So naturally you would ask which engine to pick. 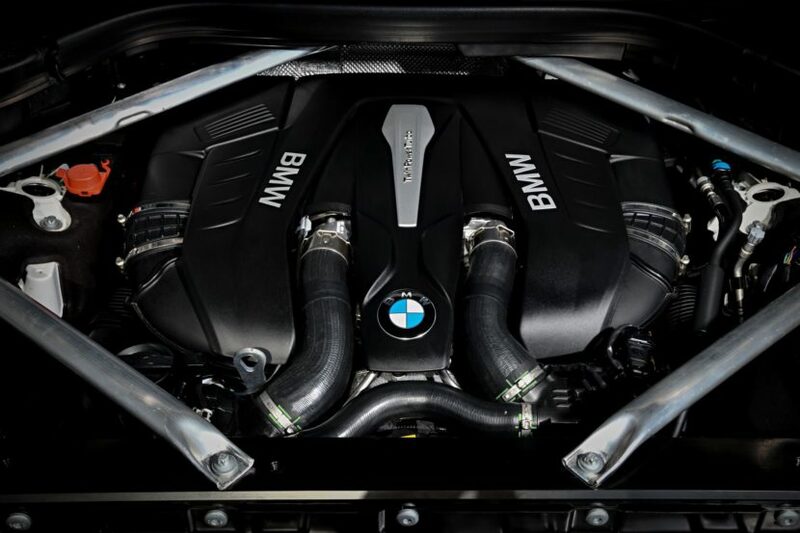 In my opinion, one good reason why I would pick the V8 over the inline-six is the more aggressive acceleration and engine noise that favors the X7 50i. There is about a 200 lbs weight difference between the two, so not a huge penalty for having the bigger and more powerful engine. Of course, assuming that money is no issue here. 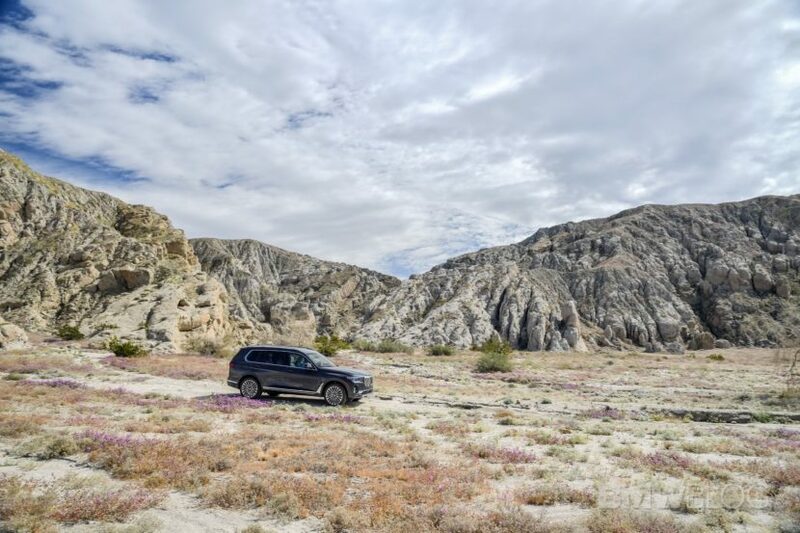 About 40 miles from Palm Springs is an area of 24,000 acres of wilderness, part of the Mecca Hills, and the site for an off-road exercise with the BMW X7. It wasn’t my first off-road rodeo with the X7, last year I took a camouflaged X7 prototype to Gulches off-road vehicle park in South Carolina. That particular park wasn’t your typical dirt road course where you can cruise in style, but rather a pretty adventurous, steep and rocky terrain. The X7 handled like a champ there. This time around, the off-road experience was more of a drive on uneven terrain with some stretches of sand and rocky terrain, where clearly the cars were not being tested to their full potential. Regardless, it was fun once again to see the big X7 in a different environment and test some of the off-road features. My X7 40i included the optional Off-Road Package (four off-road modes xSand, xRocks, xGravel and xSnow) which comes with skid plates, hill descent control, an electronic differential lock, 8.7 inches of ground clearance and a functional underbody cover. At the end of the hour-long “off-the-main road” exercise, it was clear that the X7 can handle so much more in terms of challenging terrains, so hopefully this is reassuring for those more adventurous customers. 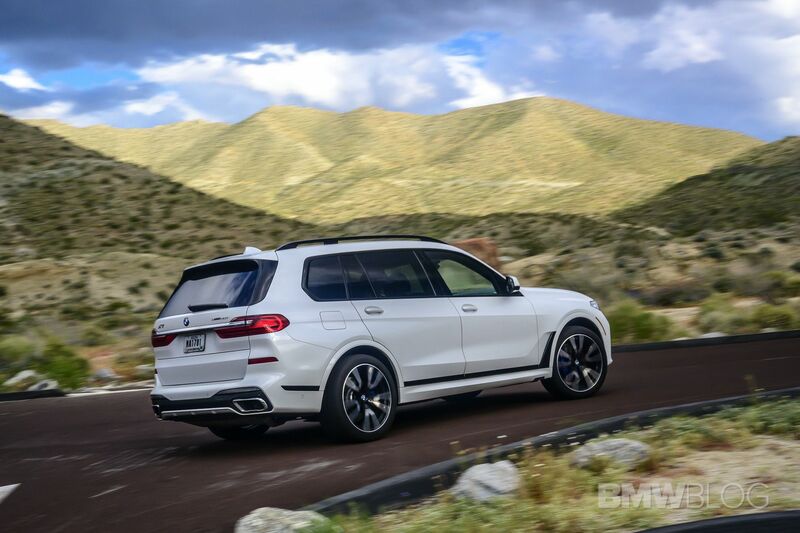 The 2019 X7 xDrive40i starts at $74,895 including destination charge, while its counterpart – the Mercedes-Benz GLS – starts at $70,150. The base Range Rover is the more expensive one at around $90,000. 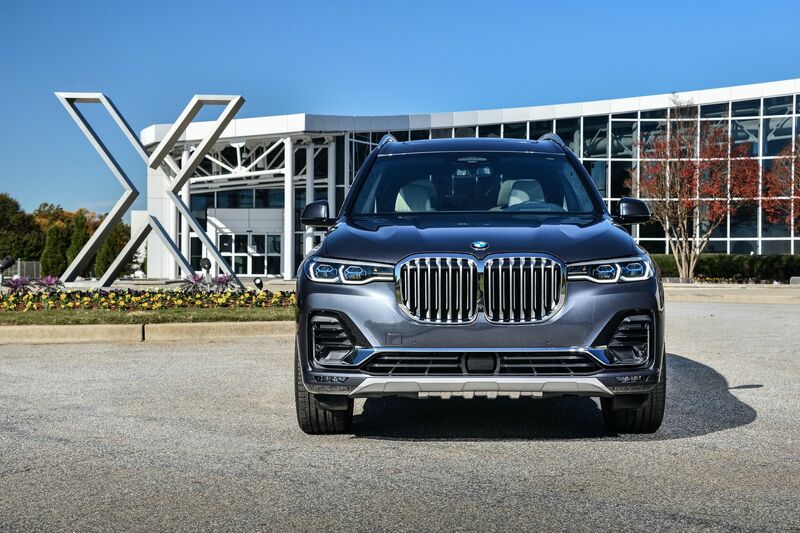 If you have $93,595, then you can go for the X7 xDrive50i. The GLS 550 retails for $95,750. As with all premium cars, it’s the option list that puts a dent in your wallet. The well equipped X7 40i I tested was priced at $100,995 and the 50i at $120,945. After driving again the X7 and seeing how the SUV market continues to grow, I do wonder why it took BMW so long to come up with a true seven-seater SUV. After all, they’ve set the tone with several crossovers before the competition caught up, and the X family is now the bread-and-butter of the company. Nonetheless, I’m excited that the X7 is here since it’s a well balanced SUV that caters to the needs of customers of this and next decade. It offers luxury, utility, space, latest tech and even good driving dynamics for a large family hauler, so I expect it to be one of the top selling BMWs in the US in the years to come. I’m also quite excited to see how customers will individualize their X7s, since without a doubt, we will see some funky colors in the months to come. P.S. The grill is big, in your face, but I love it!